In the year 1373 a young Englishwoman whose name we do not know 'she is called Julian" because she lived part of her life as an enclosed solitary in the church of St. Julian in Norwich 'experienced a series of intense Visions that she later recorded in two versions. The formal title of the "long text" of that book is A Revelation of Love. It is commonly called Showings, the word Julian herself used to describe her Visions. This edition incorporates the long text of the Showings, as translated by Father John-Julian, and a commentary written by Frederick S. Roden. A lay affiliate member of the Order of Julian of Norwich, Roden gives us a companion that is reflective yet learned. It is designed to draw the reader more fully into an understanding and experience of what Julian tells us she saw and heard. In the text and commentary we begin to comprehend the truth Julian summarizes at the end of the Showings: "Love was His meaning." Frederick S. Roden, PhD, AOJN, is associate professor of English at the University of Connecticut and an associate of the Episcopal Order of Julian of Norwich. He is the author and editor of scholarly books, articles, and reviews concerning religion, gender, and culture. John-Julian, OJN, is an Episcopal priest who in 1985 founded the Order of Julian of Norwich, a contemplative monastic order of the Episcopal Church that includes both monks and nuns under the same traditional vows and with equal status. 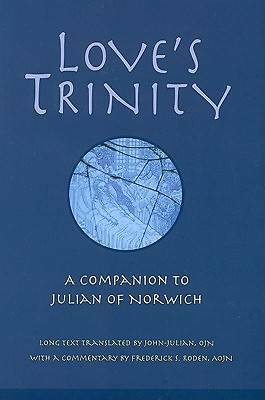 His translation a lesson of Love: The Revelation of Julian of Norwich was first published in 1989 with a second edition in 2003.